Let’s face it. Who doesn’t like to take a shortcut? 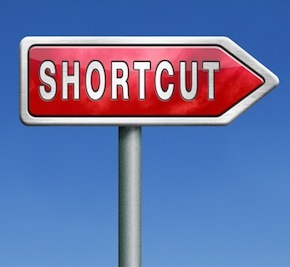 Whether you are on the way to work, the mall, or just trying to find your way out of an IKEA® store, shortcuts can come in handy. It is a fair question, and, at first, I found it difficult to answer. Let’s go through them, quickly, in order. This is really the first step in any note brokering or buying transaction. You need to find someone who is actually holding a note that might be interested in selling. Sure you can walk up to random people in the street, but it’s unlikely you will find many people who even own a note. Fortunately for us, companies like Advanced Seller Data Services spend their efforts creating lists of note holders…and all we have to do is buy them. Talk about a BIG shortcut. Typically the best shortcut is to simply mail the note holder a postcard or letter about possibly selling their note. Some people call the note holder, but I find that a little invasive (plus there are do not call lists to contend with). Postcards are still a cheap form of mailing. Sure you need to plan on the note holder getting more than one postcard or letter to take action…but you never know…maybe the first one will be the right one. Websites work 24/7. When we built Notebuyersites.com we created websites customized for the note business with built-in online submission forms. That means the note holder can go on the site, any time of day, and submit a request for quote. Websites are a big shortcut because they can be used in combination with other marketing. Email marketing? Point them to your website. Mailing a postcard? Point them to your website. Speaking to a local real estate group? Well you get the idea. Why even share a short-term strategy? Although there is no “one way” to do the note business, there are a few shortcuts that can save you time. Buying a list of note holders and utilizing a website are certainly a couple of big ways to cut corners. Again, we are not talking about building a long-term play here. So, if I believe in long-term growth of a note business, why even show off some potential shortcuts? Some people want – no NEED – to get to their first deal. To many people a couple of note deals can make a huge financial difference in their day-to-day lives. For most of us the psychological benefit of doing our first deal is incredibly empowering. Note Broker Questions: How Do I find Notes on a Budget? I know a few professionals in the note business but have not asked the following questions of them. 1. How does one become a note broker? I am looking for list of cash flow notes.Any suggestions would be appreciated.